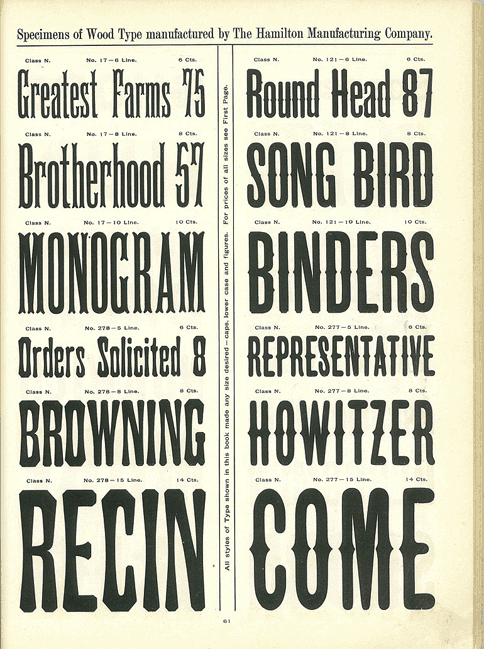 A Treasury of Wood Type Online | News, Notes & Observations | Hoefler & Co. 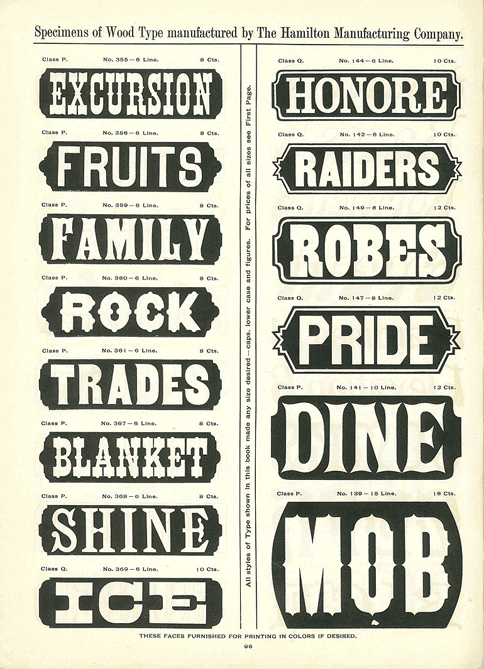 Above, a neat synopsis of the three major approaches to creating ornamental type. 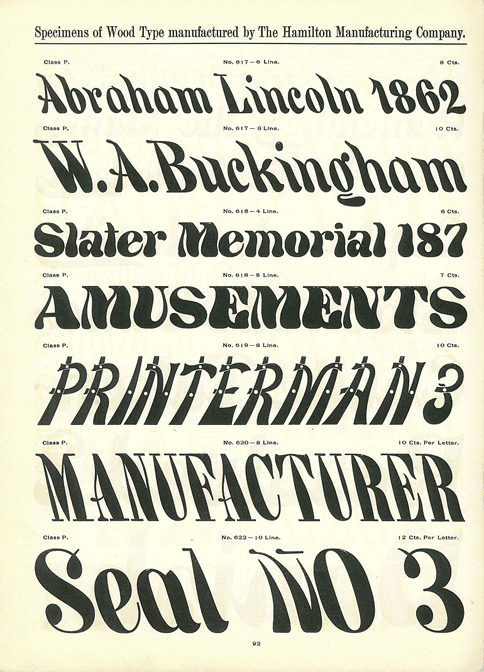 At the top right, surface decoration adorns a conventional design, in this case a condensed Gothic of the kind that inspired Knockout. Left center are some concave letters that introduce systemic morphological changes to the design of the alphabet, in this case turning the curves inside out. 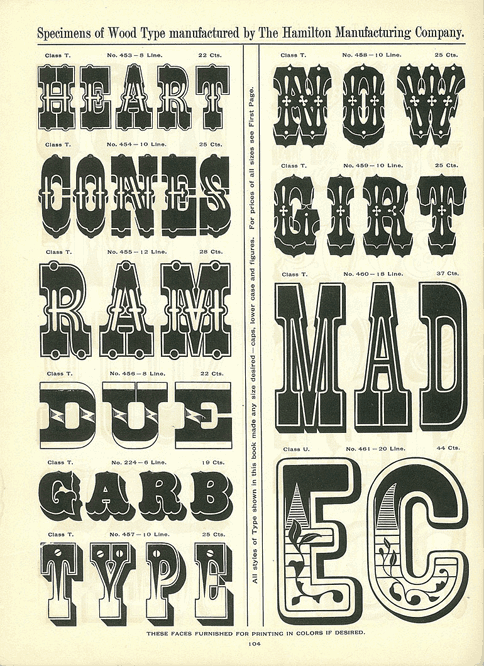 And finally, an emulative approach at bottom left, which imitates foreign materials or techniques. (This log type is a ham-fisted imitation of Vincent Figgins’ Rustic of 1845.) I find the geometric letters more successful than the fluid ones; the lugubrious vines in the lines BIE and SIT can’t hold a candle to the work of the Master of the Creeping Tendril. 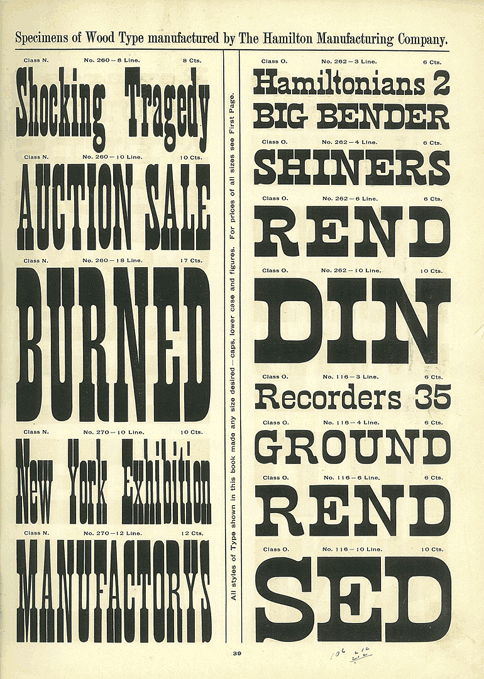 A riot of inlines, outlines, and drop shadows. 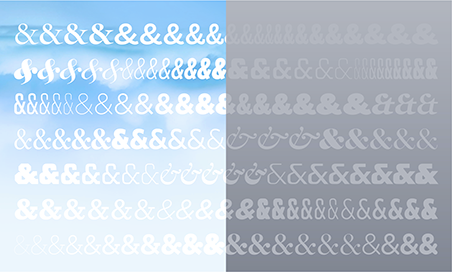 The white drop shadows in MATCH (center right) are innovative, as are the effervescent circles in RIMED, which echo the painted and lithographed letters of the Belle Époque. 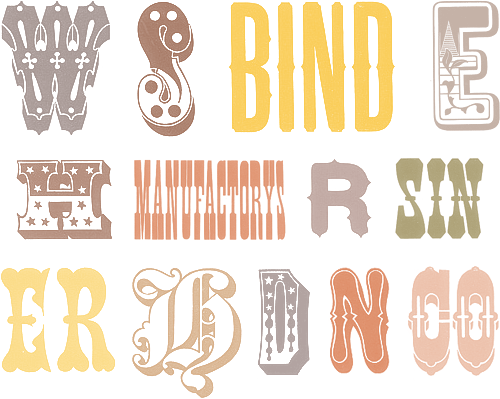 “Cameo” typefaces, featuring letters inscribed in ornamental cartouches. 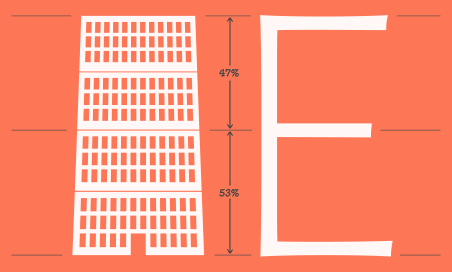 Even in digital fonts, these are notoriously hard to space: the lack of kerning kerning between the letters L and Y in FAMILY (top left) illustrates why. 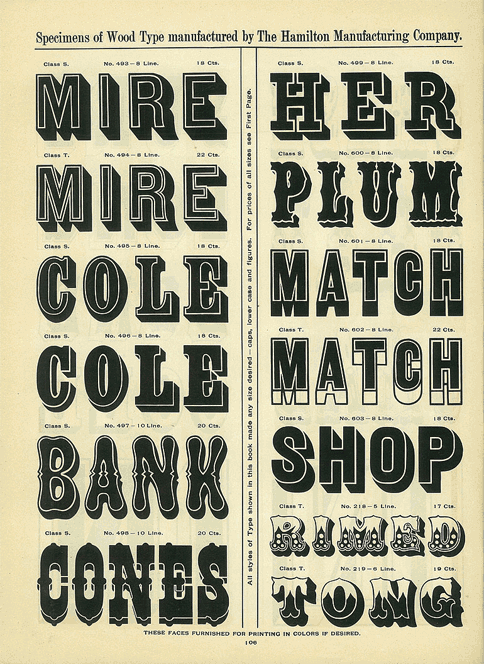 At bottom left, the word SHINE points to a common pitfall in planning an ornamented typeface: this design focusses all of the action on its beaked serifs, giving S and E considerably more esprit than their plain Jane cohorts. 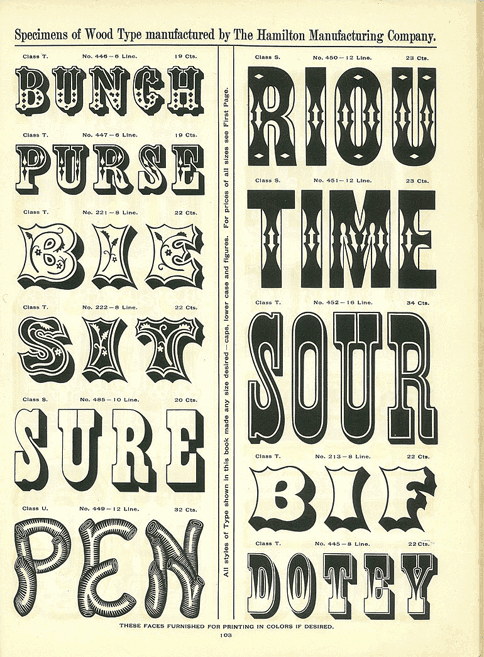 The “French Clarendon” in the left column is a style that combines three nineteenth century innovations: it features supercondensed proportions, bracketed serifs, and a foreshortening which inverts the customary relationship between thin serifs and heavy strokes. 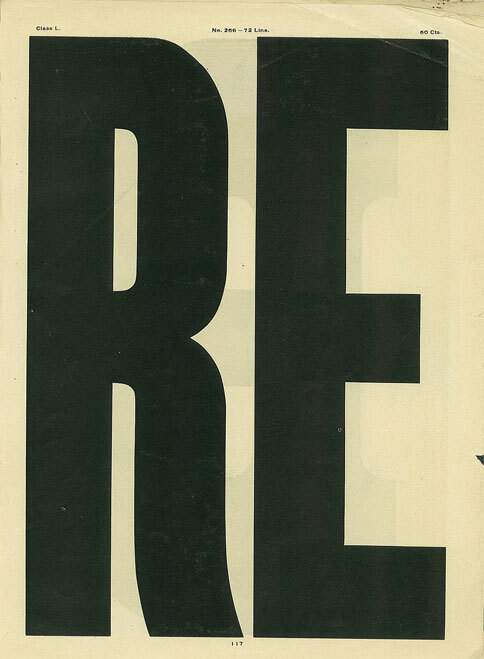 This is an especially nice one, and rare in its inclusion of a lowercase. I would not relish having to improve on the tortured lowercase g in the top line. More morphological experiments, eccentricies which look sober in this dizzying context. I like all three of these designs, especially the one at lower left, which combines concave stems with chamfered corners and inverted stress: there’s surely a way of interpreting this idea in a more modern context, which I hope someone explores. The design on the right is also witty, its soft and unthreatening corners wonderfully juxtaposed with menacing thorns. 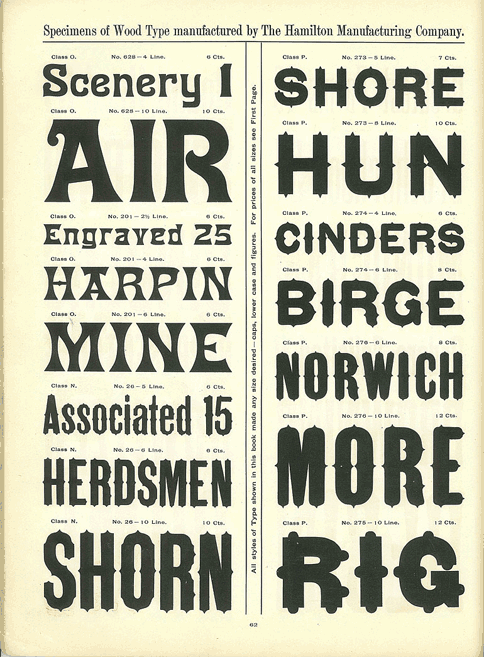 Backslanted typefaces are another nineteenth century novelty, as are designs that emulate the brush or the graver. Above, the top two lines recall the handmade annotations on photographic negatives, their swelled strokes, trailing serifs, and soft edges clearly imitating pen-drawn forms. The lowercase g is great: that its lower loop is inflected in the wrong direction is a clever way of reinforcing the backwardness of the entire design. At right, more variations on the theme of softness and thorns. It’s surprising how a subtle relocation of the spikes and knobs can so profoundly change the tone of the design: reading down from the top right, HUN has an indisputably aggressive tone, while CINDERS and BIRGE are sleepy and bucolic, and RIG has all the bombast of industry in full flower.